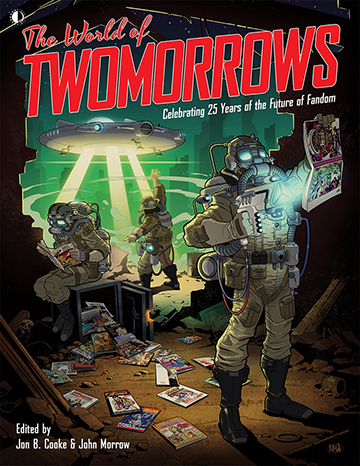 • Help make our Anniversary book a reality by pledging at: https://www.kickstarter.com/projects/twomorrows/the-world-of-twomorrows ? This entry was posted in TNT on 16 April 2019 by Mr. Morrow. 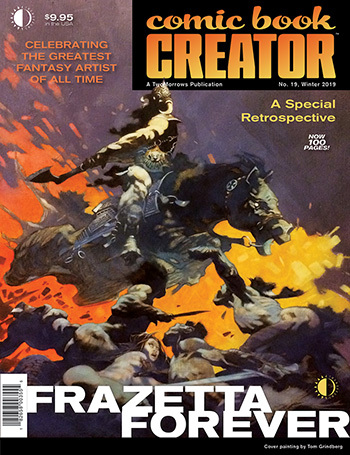 CBC #19 celebrates the greatest fantasy artist of all time, FRANK FRAZETTA! From THUN’DA and EC COMICS to CREEPY, EERIE, and VAMPIRELLA, Steve Ringgenberg and CBC’s editor Jon B. Cooke present an historical retrospective, including insights by current creators and associates, and memories of the man himself. 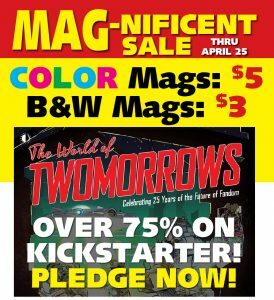 PLUS: Frazetta-inspired artists JOE JUSKO, and TOM GRINDBERG, who contributes our Death Dealer cover painting! 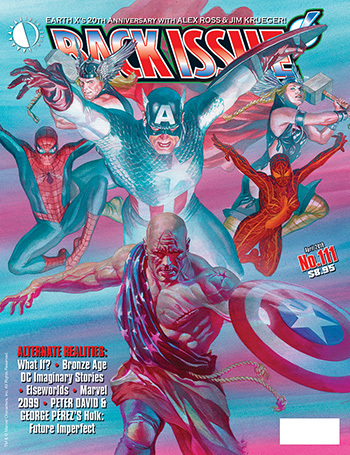 Back Issue #111 is the “Alternate Realities” issue, cover-featuring the 20th anniversary of Alex Ross and Jim Krueger’s Marvel Earth X! Plus: What If?, Bronze Age DC Imaginary Stories, Elseworlds, Marvel 2099, and Peter David and George Perez’s senses-shattering Hulk: Future Imperfect. 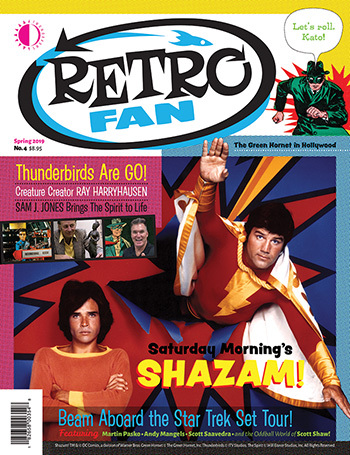 Featuring Tom DeFalco, Chuck Dixon, Peter B. Gillis, Pat Mills, Roy Thomas, and many more! 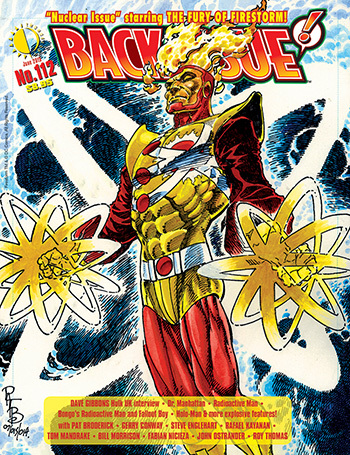 Featuring an Earth X cover by Alex Ross. Edited by Michael Eury. 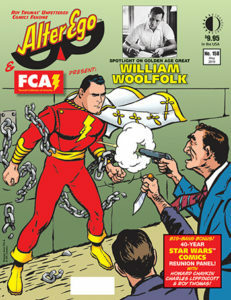 See a free preview and order HERE! This entry was posted in TNT on 6 March 2019 by Mr. Morrow. 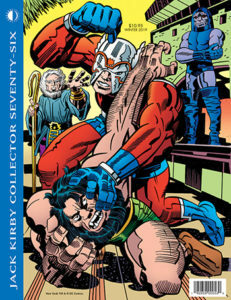 Join me (TwoMorrows publisher John Morrow) for the Mr. Media YouTube Premiere of my interview about my new book “Kirby & Lee: Stuf’ Said!”, and my 25 years producing the Jack Kirby Collector magazine. This entry was posted in TNT on 26 February 2019 by Mr. Morrow. LAST CHANCE to grab several of our books. Get ‘em before they’re sold out! 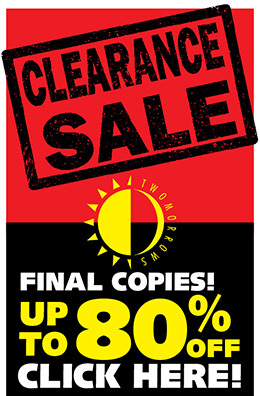 Up to 80% OFF select titles! This entry was posted in TNT on 14 February 2019 by Mr. Morrow. 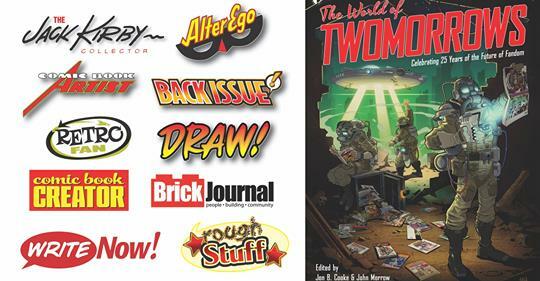 Did you know that in the late 1940s, in the male-dominated business of comics, WONDER WOMAN has a female writer? 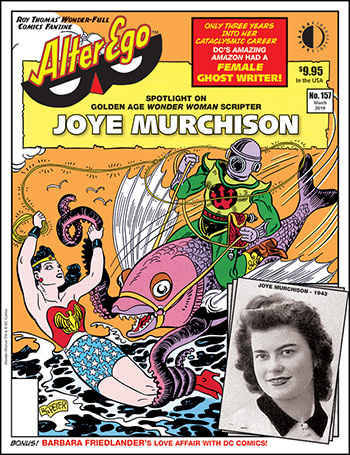 Find out more in Interview ALTER EGO #157, which ships today with an interview with JOYE MURCHISON, assistant to Wonder Woman co-creator DR. WILLIAM MARSTON, and WW’s female scriptwriter from 1945-1948! This entry was posted in TNT on 6 February 2019 by Mr. Morrow. 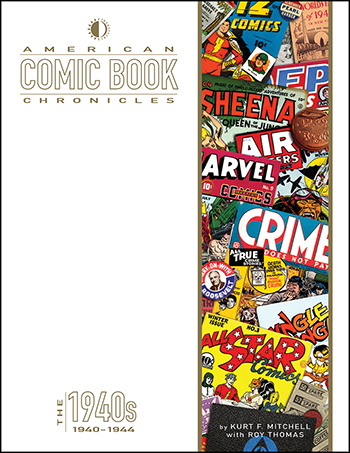 FEB192024 AMERICAN COMIC BOOK CHRONICLES: 1940-44 (Hardcover) – NEW! 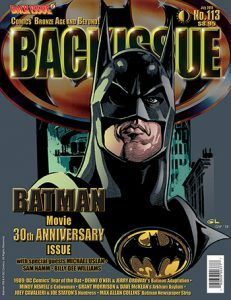 FEB192025 BACK ISSUE #112 – NEW! This entry was posted in TNT on 30 January 2019 by Mr. Morrow.